I’m training for the Copenhagen Marathon in May of this year (2015), and have been using Strava and a new Fitbit Surge device to track my runs. Unfortunately the two systems are not compatible (update May 2015–they are now compatible, details towards end of this post), and I can’t use the heart-rate readings from the Fitbit Surge as health data inside the surge app. I just completed a 15m training run and I thought I would post the side by side data that the two apps gathered in hopes this might be of use to other runners considering using either of these two systems. The GPS tracking of the Strava, which is running on my iPhone 6, is much more accurate than the location readings on the Fitbit Surge. The Strava/iPhone readings are really precise and show small variations in my 4 laps around the lake. The Fitbit Surge GPS is almost comically “loose”, suggesting a meandering variation on each lap, sometimes straying into the lake itself or across non-existent streets. The splits/pace information is pretty consistent. I tried to start both devices tracking at the same time, but the differences in the splits and the total distance and time of the run may be as a result of slight differences in start time, and, when I paused for a 40 second water break mid-way i manually paused the fitbit clock, but the Strava was on auto-pause and may have taken a different sense of that timeframe. That would account for the 2:05:08 (fitbit) v 2:05:34 (strava). No idea how to rationalize the 15.01m Fitbit distance vrs. 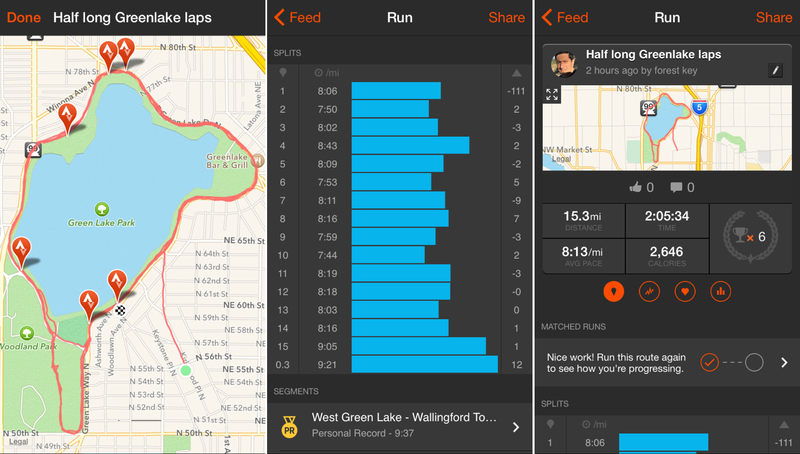 the 15.3m for Strava, which results in the pace discrepancy: Ftibit says i had a 8:20 overall pace, Strava 8:13 pace. My sincere desire is that Strava and Fitbit will get their systems connected, not sure who has the burden to do what work, but certainly can’t be very far from core to their missions to support as many devices/APIs as possible in this connected health tracking wearable category? 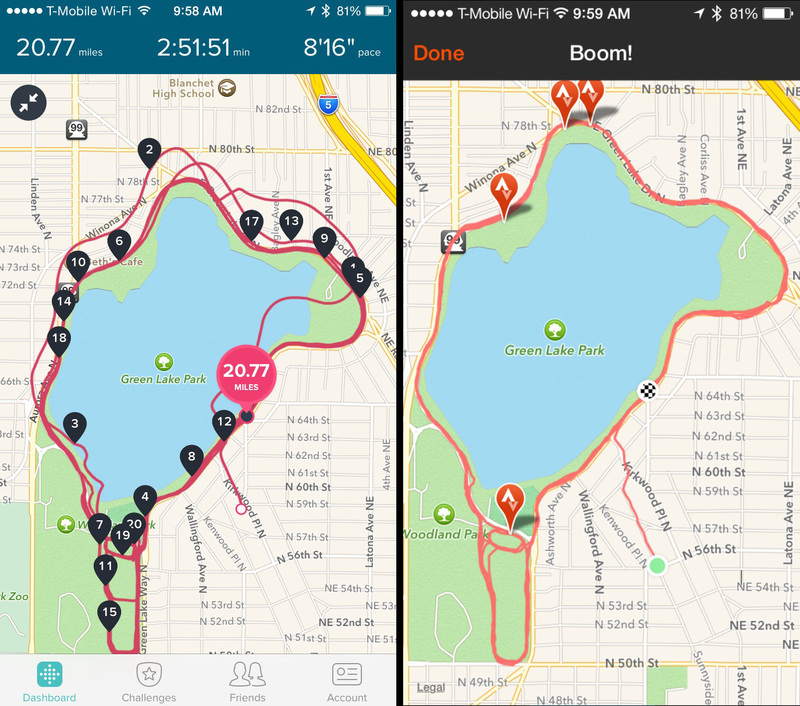 Strava is focussed on community, Fitbit on devices–let’s go guys! The Fitbit Surge is VERY inaccurate in terms of distance travelled on a run, whether that be a 3 mile or a 21 mile course, on road/path or on a treadmill. I’ve seen a consistent 15-20% under-report of distance run in both free-run (GPS tracking on) mode and “treadmill” run mode. In Treadmill mode the distance travelled is under-reported almost comically–the device is just pretty much worthless in accuracy on a treadmill. I would think that the device’s software could compare my GPS enabled and not-enabled runs and correct itself to a better estimate of my gait/pace based on the other data its sensors are gathering. Alas, the software is clearly NOT doing that kind of comparison of the data and optimization to individual user performance. The Fitbit Surge is VERY inaccurate in terms of geo-location in GPS mode, and as a result, the pace readings during a run are absurd as well. While running at a 8:15 minutes per mile pace the surge will report anything in a range of 7:45 to 9:30–ostensibly because it has no idea where i am physically on a map. The readings that come back from my runs are hilarious–showing me running through buildings, into lakes, etc.–yes, it is approximately correct, but nowhere near accurate enough to track distance and therefore useless for pace and overall splits. While i have no second heart rate monitor tool to compare the readings to, i’m also confident that the hear rate readings are wildly inaccurate, as during a long run where i’m in a steady state zone of pace/energy/effort, the heart rate readings will ramp up and down by 10% range which is attributable to inaccuracy of the device’s readings, not variations in my heart rate load. Give my first 2 months of experience with the Fitbit Surge, i would not recommend as a health tracker–way too inaccurate. I’m actually now very curious about the Apple Watch which is shipping soon, given that it will rely on the phone for measurements which i’ve found to be much more accurate (via Strava). Update May 2015. So a few things happened next for me. On a 15 mile run i tripped and fell face first into a ditch. At the time i had enough natural endorphins pulsing through my body that I just got up and kept running–but within 24hrs i was in incredible pain along my left rib-cage. For next 5 weeks I have been laid up and haven’t been able to run, alas, the travails of training for marathons (this seems to happen to me 50% of the time I train). So i missed my marathons (i had rescheduled my target run to the San Luis Obispo race, since I was ready for a earlier race than the originally planned Coppenhagen). At this point, i’ll be re-starting my training for a late summer date tbd. Fitbit released a patch to firmware that some have asked/suggested might improve accuracy. I have yet to try (will update once I do). Fitbit got their act together and there is now compatibility with Strava, http://strava.fitbit.com, which seems to push performance data back and forth between the two systems. Yay for fitbit. I’m going to try soon, have linked my accounts but am not yet pushing real miles through the system so need to get my runs up to 5+ miles for the data to be interesting. i got an Apple Watch, and have started using it as yet another ecosystem of data and sensors. I miss my Fitbit. Apple’s passive tracking focusses on 3 key performance indicators (KPIs)–how often you stand for 1 minute in an hour of each of 12 hours of a day, how many minutes of “activity” you have in a day, and how many calories you burn in a day. I miss the Fitbit Surge’s focus on steps and distance and stairs/steps, which felt more accurate and meaningful to my daily “activity” goals. The Apple Watch notion of standing for 1 minute of each hour leads to several little notifications throughout the day while i’m at work at the end of a 60 minute meeting that has run over a few minutes… when suddenly not only I, but the other geeks in the room with a new Apple Watch, all get this little buzz on their wrists. I feel like a lemming! The little concentric circles in the UI of the watch, each representing one of the 3 KPIs, is *very* cool visualization, but the KPIs that are being tracked are not for me! 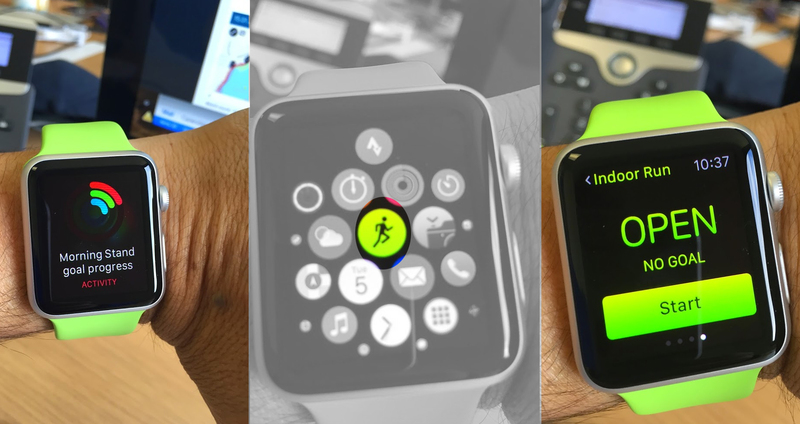 As a distance/performance tracker, i’ve had limited experience but the Apple Watch application with the green circle and a figure running, which offers tracking for various walk, run, swim, row, pedal type sport workouts, is really pretty lame. It allows distance, calorie, or time targets or Open setting to just track–but it doesn’t track GPS activity on the watch or give splits or any other serious feedback on performance. I think apple will add more integration of this data in the future, or build a companion app for the iPhone… but for now, this is pretty much useless. Strava does have a nice handy companion app so that you can start/stop and get other workout data from the watch, while the phone in your pocket running Strava does the real work. This seems likely to be my continued preference, and also gives me a remote on the watch face to control the playback of my iPhone spotify account (which i couldn’t do before without taking the phone out of my fanny pack on long runs). So i thin the Apple Watch is going to be a great REMOTE to control my iPhone, but not a self-contained tracker to replace a wrist worn GPS tracker or activity tracker of any kind. Weird, yet another thing to put on my wrist/pocket while i run which also does NOT actually do all the things I want! Apple Watch exercise app says I ran 3.83m, 32:54 time, 288 calories (active), 61 cal (resting–no idea what that is because I was running the entire time, must be part of run where my heart rate was in a lower range, nay, incorrectly reading as low as I was running fast first mile), 349 total calories, 8:34 pace, average heart rate 175bpm (yikes, i’d be dead if that was true–i’m 44 years old). Pretty poor and inaccurate data. Fitbit Surge says i ran 4.00 miles, 32:38 time, 8:09 pace, calories burned 474, and average heard rate 160 bpm and of the 33 minutes heard rate was in “peak” range 30 minutes, cardio range 2 minutes, fat burn 1 minute (seems like much much better heart rate readings than the apple watch. In figure above the Strava track is on the left, Fitbit on the right. I can definitely see huge improvements in accuracy and much more frequent samples in the Fitbit Surge data, which actually caught a few subtle route details that were missed by the Strava plot. This is a huge improvement. Based on this run’s data, if Fitbit and Surge data integration is actually working (still tbd how to make that work) i think i might sell the apple watch to a colleague at work who wants it, and go back to using the combination of fitbit and strava. The apple watch is a turkey–too little battery life (1 day), not enough useful functions, and crappy sports tracker. I’ll add to this post if I learn more. Happy I stumbled upon your post while researching this device and Strava. A friend has the surge and likes it, but without upload to Strava it is a non-starter for me. Coincidentally your name came up while having coffee with friend Jim Feeley last week. He wondered if we knew each other. I don’t think we do, but our paths are not dissimilar. Would be fun to meet some time. I’ve been running halfs lately but am committing to my first 50k in October (Baker Lake). Hey wplate; yes, i’ve known Jim Feeley from the way back machine in the 90s in bay area, have really enjoyed following his monster biking and running performance on Strava, he’s a monster. I’m going to check out the iWatch to see if it performs better–the fitbit surge is just not a good athletic tracker, it is fine for casual daily lifestyle tracking (steps). I’m very confused throughout your post. First you don’t like the Surge, then you do (through an update it appears) and then your comment here says it’s not a good tracker for fitness. Am I missing something or is it timing from before and after update? I have the Surge and I’m experiencing the all over the map readings, which is frustrating. I wrote the post over several weeks, yes, the blog post is messy as a result–sorry! Are you happy with yours? Great post. You just saved me from buying a useless device! i’m going to give the apple sport watch a try and see if the combination of strava+apple iwatch works, i have high hopes! Can you please update us on whether the update fixed the GPS inaccuracy issue? Can you please update us on whether the new software update fixed the GPS inaccuracy issue? Per my update to the main post, i believe that YES, the firmware update has greatly improved/fixed the accuracy issues I wrote about! Did the big update fix any of the GPS issues? I’m considering a purchase as well but I’ve heard some conflicting reports on its GPS accuracy – some say it’s fine and others say it’s terrible. Obviously, many other factors at play here, but just want to hear your experience post update. I haven’t tested yet as I have a injury and have been hobbled. will run as soon as i can, now with iWatch from apple as a 3rd tool, and post results. 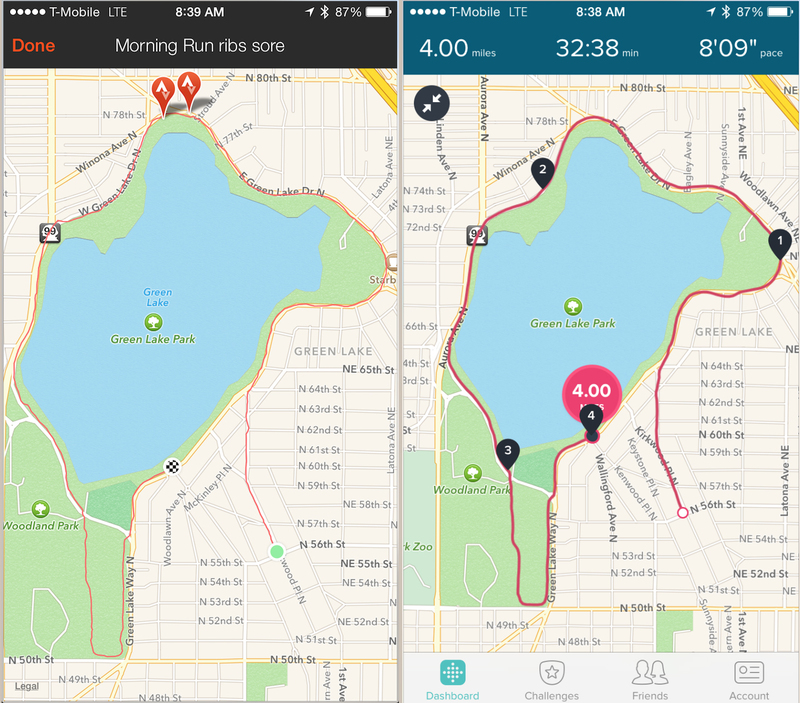 Oh, and there is official support for Fitbit Strava sync now too. Go to strava.fitbit.com to connect your accounts. Thanks for the info Sam, i had not seen… glad to see strava and fitbit playing nice. Sam have you figured out how to get it to actually work? i signed up for the connection and successfully got the accounts paired, but after a run just now i can’t figure out where the data is being shared or how to see it combined in interesting ways? Even though FitBit is claiming to officially support syncing with Strava, a great number of FitBit users are not able to consistently do it. An activity tracker is suppose to make you feel confident and reassured about your activities. I’ve found that the FitBit Surge causes mostly stress because it does not work consistently. As an avid athlete and purchaser of the FitBit Surge, I can tell you that this device falls very short of all of its claims. It doesn’t sync reliably, it doesn’t charge reliably (eventually the plug becomes too loose), and the features offered on the website for syncing with other activity tracking sites like Strava, MyFitnessPal and Endomondo are frequently not working. The technical support does not seem able to understand or take appropriate actions to remedy these short comings. If FitBit wants to compete with other companies offering similar products, they are going to need to do some significant work. I just got a apple watch and will run with it, strava, and fitbit with new firmware and post results as soon as i can get to it! 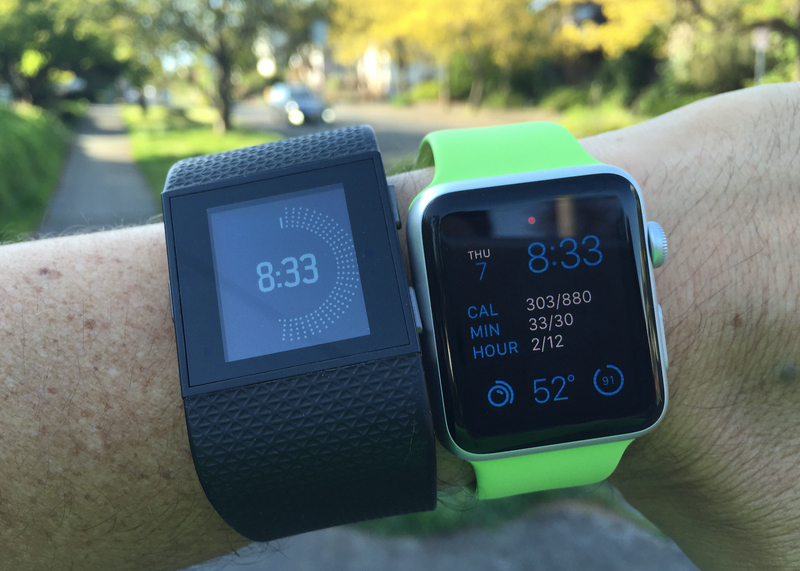 Pete take a look at my updates to the post–Fitbit Surge working much much better after firmware update! Forest, thanks for the update, really appreciated. I’m liking the watch so far, battery life is good — considerably better than the MS Band that I was considering –, and I stay with the FitBit ecosystem & friends. Hi interesting thread Ive just stumbled across. I got a Surge at the weekend on account of having got sick of carrying my iphone 6+ brick around for the benefit of having Strava. I’ve only done two runs with the Surge so far, but on the two 10k runs I did, I found there to be 0.15 km difference between the Strava and the fitbit distance on one run and 0.6km difference on the other (two different routes). As you say, the route plot from the Surge seem a bit questionable in places – not sure whether the issue is GPS accuracy or if the Surge is perhaps taking fewer and more widely spread sampling points than on the iphone 6. Either-way I can imagine a serious runner will find it frustrating that the two aren’t giving more similar figures when they are using the same satellite data. That having been said I’m not a serious runner and my distance and speed need to be considered against other variables such as lack of sleep, pigging out on beer cake and other unmentionables so whilst the difference is disappointing, Im not losing too much sleep (assuming the sleep app is correct) as its close enough for my needs. Ironically I got the surge in place of my Charge HR (which is non GPS) and I loved the charge. If you want very accurate GPS then at the moment the Strava / iPhone connection seems to be more accurate than the Surge. Ian i agree with you that the fitbit is a nice balance of data that isn’t necessarily a deal breaker, just not as great as other GPS trackers and if distance pace are top concerns, then not the right product. I’m about to write up my findings with Apple Watch which i have been using this week, will add them to this post. Hi, and thank you for the wonderfully detailed review. It’s been very helpful. One question though. You mentioned that you were using the iWatch as a Spotify remote since you couldn’t do that before. But Fitbit Surge advertises that you can use it as a media controller. Doesn’t that work, or is it a problem limited to Spotify? Actually you are correct. I previously was not using the remote play control on the fitbit, but i have since turned it on and it works great! 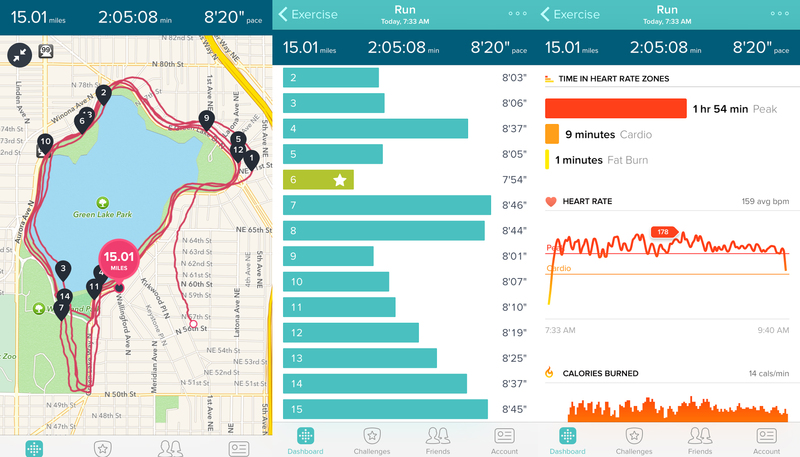 How has your experience been with Fitbit Surge GPS accuracy since firmware updates? Wondering if GPS accuracy has indeed been improved. Improved for sure. Still a bit wacky, but better! Thanks. I had the pre-release of the Surge before it went on sale. GPS and HR was so off compared to devices such as Garmin. I ended up returning it. Curious if it’s worth trying again. Any input would be great. Thanks!! Hey Aaron, sorry nothing new–I’ve been using indoors most recently as weather is fall and wet where I live, so have done less calibrating as of late! This was very helpful. I got my fitbit Surge in December , I was sick of using a stopwatch and math while trying to figure out miles and pace during races. I find that the fitbit is frustrating telling me i’m much slower and even messing up on miles while they’re clearly marked on a race course..and Strava much more accurate but I don’t want the weight or hands filled with a phone in a race. I really like the size of the watch and the steps and calorie counter, any device that could be better or do I need to synch my strava and fitbit? Any advice would be helpful! Previous Previous post: buuteeq’s new name?